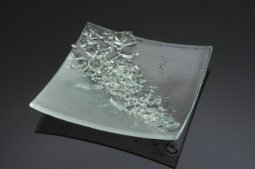 I have chosen to work with glass to express ideas of space, light and movement. 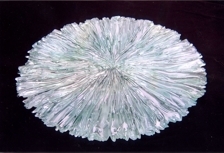 The inherent qualities of the glass imbue the work with a spiritual and ethereal quality. My current work has been inspired by a tumbling waterfall and river at Lydford Gorge in Devon. 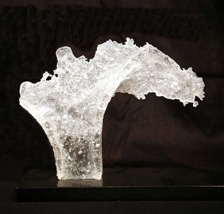 The pieces are fused and formed in the kiln and enhanced by the additions of dichroic glass.